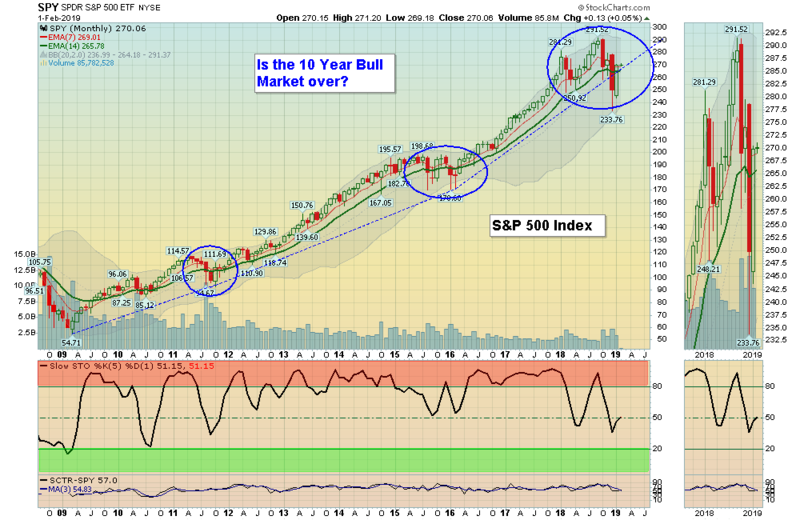 Is the 10-Year Bull Market over? 02/03/2019: Many have been asking if the recent pull back in the Markets was another Correction like in 2011 and 2016, or has the 10 Year Bull Market ended. Many are predicting the answer, but they don’t know. With Charting or Technical Analysis we Count the Money Flow. After a long Trend upward, usually the Investment will TELL US when to Sell either by breaking below the Trend Line or Failing to make a New High (Right Shoulder). We will have to WAIT to see. We like to Buy strong Investments that have recently pulled back from New Highs, and currently that list has become small. But if you continue to follow the Green Line Rules you should make more than you lose in any type of Market (the Money has to go somewhere). Markets were up again this week as several Indices closed back Above the Green Lines. However, the DOW & S&P 500 have bounced about 15% up off the Lows which will probably indicate that some profit taking will come in soon. For the week the Dow was up 1.32%, the S&P 500 was down 1.61%, and the Nasdaq 100 was up 1.30%. The very Long Term Trend on the Stock Markets is UP. The DOW Index, S&P 500 and the NASDAQ 100 are the major US Indices that closed Above the Green Lines. The Inflation Index (CRB) was down 0.07% and is Below the Green Line, indicating Economic Weakness. Bonds were down 0.58% for the week and are Above the Green Line, indicating Economic Weakness. The US DOLLAR was down 0.20%, and the Relative Strength is now dropping. Crude Oil was up 2.92% for the week at $55.26, and GOLD was up 1.85% at $13.22. We are currently in 5 logged Open Positions, for the Short & Medium Term. There are 2 Investments on the Short Term Watch List. FTNT FORTINET INC. Caution! Weekly Money Wave is almost to the Red Zone.